Google have now released a special Google Flu Trends page for Mexico. 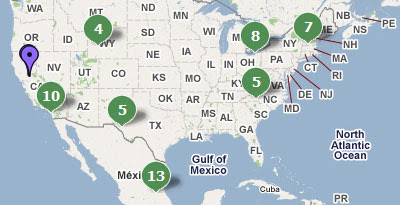 The page uses Google search activity in Mexico to help track human swine flu levels. Unlike the Google Flu Trends for U.S., this data is not validated against confirmed cases of flu but after conferring with US and Mexican health officials, Google decided to share these results "to provide additional information on the evolving epidemic." The page includes an interactive Flash heat map of the Swine Flu outbreak in Mexico. Pointing at any region with your mouse will bring up a legend informing you of the current level of the outbreak in that area. Google Maps mashups of the Swine Flu Outbreak are still being produced thick and fast. The latest comes from crisis information crowdsourcing website Ushahidi and is actually one of the best maps of the outbreak so far. This Google Map of the outbreak allows you to filter the results shown on the map by Confirmed Cases, Suspected Cases, Confirmed Death, Suspected Death and Negative. Beneath the map is a graph showing the rise (and hopefully eventually the fall) in cases of Swine Flu. The user can adjust the dates to view a graph for any period and the data on the map will change to reflect the date range chosen as well. Like all of Ushahidi's Google Map mashups users can submit information to the map by filling in a short form or by sending an SMS message. Click2Map, the map creation website, have also produced a Google Map of the outbreak. The Click2Map Google Map lets the user filter the results shown on the map by Confirmed cases, Suspected cases, Deaths and Negative. The map makes good use of numbered marker clustering which allows the user to get a quick overview of the extent of the outbreak in different states and countries. The Click2Map map also has a search facility so that the user can find a location on the map that they are interested in viewing results for. 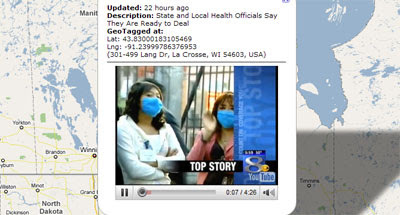 Another interesting way to keep up-to-date on the latest news about the outbreak is via this Google Map of geotagged YouTube videos about Swine Flu. The map includes a number of videos about the outbreak, mainly from news channels. The map includes a handy forward and back button which makes it easy to skip forward to the next video. How do you add suspected cases to one of these maps?